Part I: The Hypergeometric and Spherical Functions. Part II: Harmonic Analysis on Semisimple Symmetric Spaces. Part III: Are K-invariant Eisenstein Integrals for G/H<$> Hypergeometric Functions? References. Index. 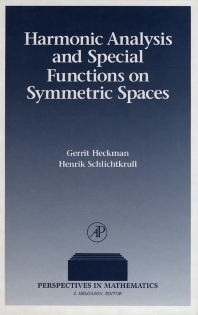 The two parts of this sharply focused book, Hypergeometric and Special Functions and Harmonic Analysis on Semisimple Symmetric Spaces, are derived from lecture notes for the European School of Group Theory, a forum providing high-level courses on recent developments in group theory. The authors provide students and researchers with a thorough and thoughtful overview, elaborating on the topic with clear statements of definitions and theorems and augmenting these withtime-saving examples. An extensive set of notes supplements the text. Heckman and Schlichtkrull extend the ideas of harmonic analysis on semisimple symmetric spaces to embrace the theory of hypergeometric and spherical functions and show that the K-variant Eisenstein integrals for G/H are hypergeometric functions under this theory. They lead readers from the fundamentals of semisimple symmetric spaces of G/H to the frontier, including generalization, to the Riemannian case. This volume will interest harmonic analysts, those working on or applying the theory of symmetric spaces; it will also appeal to those with an interest in special functions. Graduate students in mathematics; researchers in algebraic, analytic, and geometric methods.